Have you ever received a golf accessory that you just could not wait to use? When I get a new “toy”, its like a newborn child. You just cannot wait to take it out and give it a trial run. Unlike clubs, where you usually demo them first, most accessories you buy because you assume they will work. This little guy was no different. I was first told about the Golfball Hog by a couple of readers that said I just had to try this thing out. Golf ball retrievers are a dime a dozen and I have always gone with a simple approach. I got the cheapest one a store had that had the longest reach. It seemed to usually work. I replaced my retrievers every few years, but they always did their job. Then came the thought of “never having to buy golf balls again. I just had to get my hands on one of these beauties. It seemed logical. You drop the “rake” into the water and drag and all the gems that people lost would soon be in your hands. 1. It has an 18 foot reach. 2. 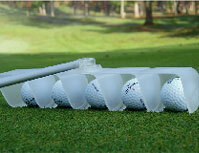 It “picks” up five golf balls at once. 3. It swivels and folds up to be about the size of the driver. After a few days of having to play with store bought balls, the retriever of my dreams finally arrived. I had already played that day but decided it was worth the money to go play again. After all, I would make that back in free balls right? Heck, there is water on almost every hole on the course I play. So I patiently wait until hole number three of my course. It is a par 3 and it is all water to carry the green. I knew this would be prime real estate for my digging. The first thing I notice is that although it extends to about 18 feet, once extended, it is like working with a wet noodle. But I don’t let that deter me from finding all the ProV1’s that I can get my hands on. I dunk it in the water and rake the bottom. 1st try – A whole lot of mud and nothing else. 2nd try – The swivel mechanism kept moving instead of locking into place so we got just water. 3rd try – 2 balls and a twig. 4th try – Gross mud and algae. 5th try – Had 3 balls, but then the swivel mechanism moved again and they fell back in the water. Well, I don’t know what they meant by “not disturbing lake and pond bottoms” but this thing sure did. The worst part about the thing is that it is a pain in the neck to clean. If you are not putting it in clean water or hit the bottom of the pond, you get “guck” all over the place. And then the real question becomes, WHERE DO YOU PUT THE THING ONCE IT IS FILTHY? I didn’t want it back in my bag or my cart. We decided that maybe it was that body of water and that we would give it another try. So on the next hole, there is another area right behind the green. 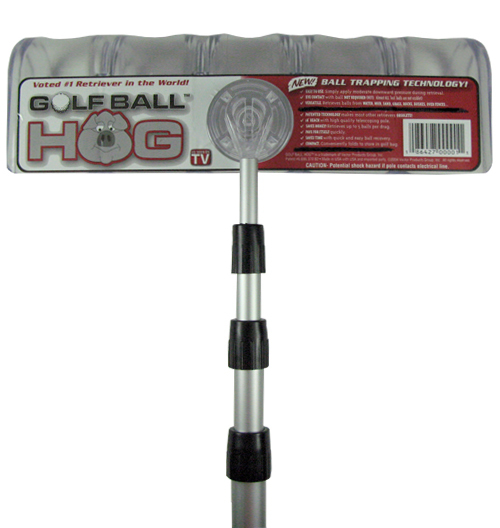 After putting out, we pull our filthy Golfball Hog out and go to work. 1st try – Mechanism turned again and we dropped the 3 balls it had picked up. 2nd try – All mud again. 3rd try – Got 2 balls. 4th try – Had mud and balls, but mechanism turned again and we lost them (not the mud, just the balls). At this point we just figured it was us. So we finish our round with this device dripping mud and water everywhere and head back to the clubhouse. On the way back I see some people at the range hitting balls (our range is water with islands) and decide that I would have them demo the unit. We give it to the gentleman and he extends it out to 18 ft and puts it into the water. The water is clear in this area and we see that he has picked up 4 balls. As he is pulling the unit out of the water, the head snaps off. When he pulls it out, all he has is the telescoping wand and nothing else. I guess that sums it all up. I come back to my office and call customer care. I get a voice mail. So I decide to send an email. I still have not received a response from that, and it has been quite a few days. I finally spoke to someone that basically said “that should not happen”. Thank You. Overall thoughts are pretty straightforward. The idea behind the product is genius. The execution of the product is flawed at best. I urge people to stick with what they are using or find something simple and easy to use. This product unfortunately gets a THUMBS DOWN from THP. It was a total let down. I guess the old saying is Caveat emptor. Let the buyer beware. If this review sends you itching for one of these and you want to try it, you can find more info at Golf Ball Hog. Ha, very entertaining! I’m looking for one (never had one), good to know what one NOT to buy. Might have to check into that cool looking Cally one. It would have been enjoyable watching you test out the unit. To have been there when the end fell off would have been priceless! As I was reading it I was thinking “Great idea” but wondering “does it really work”? My question was answered. I look forward to the ‘new improved version’ (one day).